At one time I lived in the building that was the toll house on route 110 in Melville, NY. I believe my parents, the Schimkats, owned this house sometime between 1949/1950 to 1953. I remember the name of the people from whom my parents purchased this home- the Zapfs. I do remember this tea pot on a corner shelf in the kitchen the day we were there to look at the house. I really liked it and when we moved into the house the Zafps left it for me. Still have it to this day. Story was it came from France. At that time and my age I could only imagine a land so far away. Howard Kroplick Note: According to my favorite co-author Al Velocci, Jacob Zaph of Astoria bought the bungalow and property from the Long Island Motor Parkway in 1934. Zapf paid $50 for the bungalow and $800 for the land. I remember the four-room building so well. The front room was two steps down from the main part of the house and my dad used it as his office. Their bedroom was on the front right, living room front left. My little bedroom was on the back side, left and the kitchen backside right. There was a full basement to the house. Oh yes, just remembered, when we bought the house, it had one roof off the front room where I guess cars would pull up. The house looked exactly like the Mineola Lodge. Howard Kroplick Note: The matching roof lines. My parents took the roof off. My parents had my grandfather and friends help them with the renovations both inside and outside the building. Judging by the height of the foundation compared to the Mineola Lodge, it is so much taller. My thought being, maybe the lodge was moved to the location where I lived from a near-by location. Howard Kroplick Note: The Huntington Lodge was moved off the Motor Parkway around 1939 to a location just south of the right-of-way. A basement and new foundation were added at the new location. As you can see, from one of the pics with me in my red riding hood cape, a ladder stood to my left, so I assume work was going on at that time. That was about 1949/1950, assuming the time of the purchase. When we lived there the house was sided with some type of a brick like shingle. My parents had to clear a lot of tall grasses and small scrub brush. I do remember being out in the grasses and many bees went up my pant leg and stung me. Very painful. While I was poking around online today I also discovered that the area was known as Sweet Hollow. That would explain all the bees. 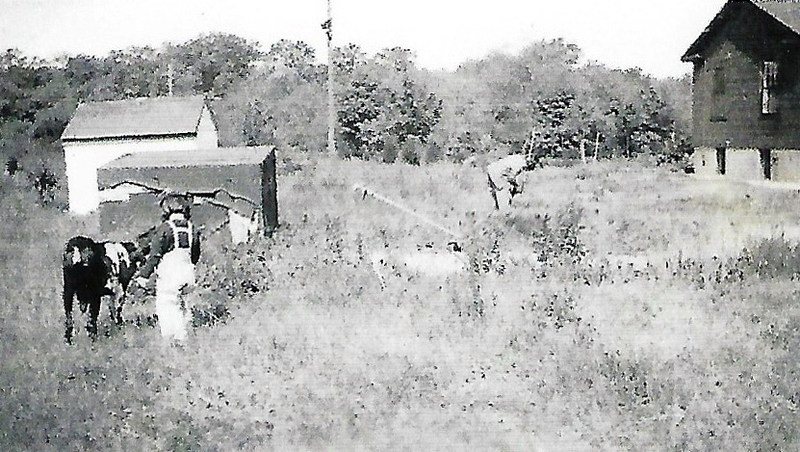 There were also many additional outbuildings and a produce farm next to our land. As a little kid, I would go off to the Motor Parkway and hike it. There was a lot of overgrowth on the parkway. 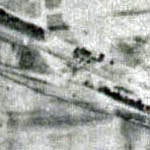 At that time, the bridge was still in place over route 110. 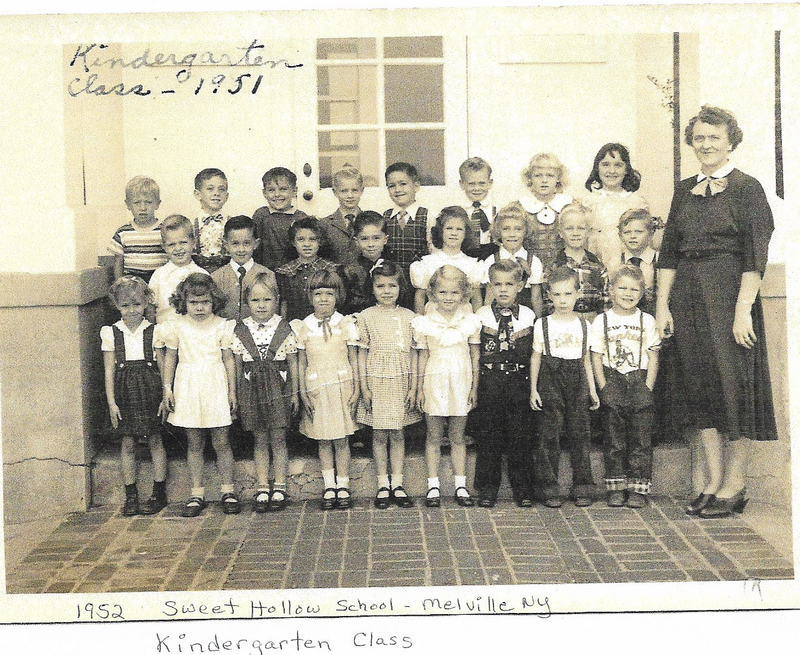 This is the Sweet Hollow School where I started kindergarten. I am located in the front row five from the left and five from the right. Story of my life, living right in the middle. Life is full of choices when you are in the middle. 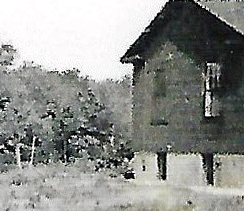 Sweet Hollow School was a four room building and a basement. It was not far from the house, as my mom would walk me to school. We would walk east on the parkway and then took a shortcut somewhere and ended up at the school. The family name is Schimkat (German). 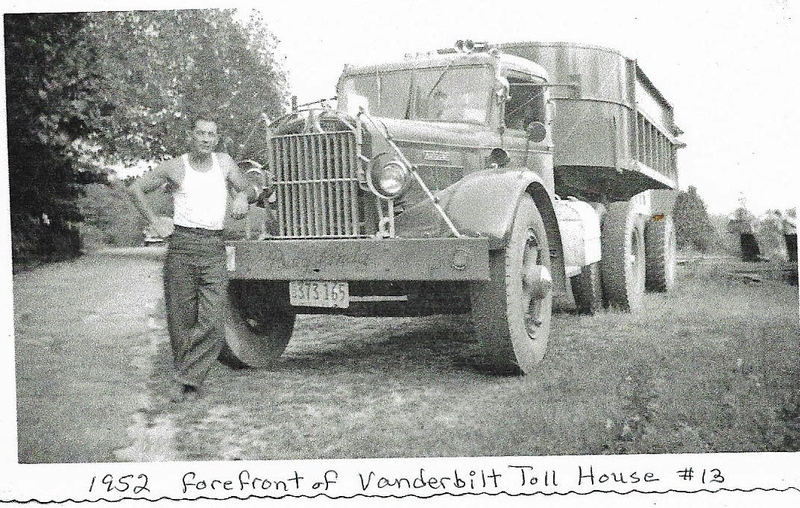 The truck picture is of my father, Elmer H. Schimkat. He would have been about thirty-nine at that time. I kept the Standish name after my divorce. Made it much easier raising my children. At one time my dad worked for William Durkin trucking and many of the trucks were parked each night. In our front yard because they were hauling the sand from across route 110 to another location. One very stormy night all the truck batteries were taken from the trucks and the police were called. This made the news but don't know what newspaper that would be. This truck is like the ones broken into during the robbery of the batteries. This is the forefront of the property right along route 110. To the left of the truck is the driveway which was made of the same material as the parkway road. The driveway ended just beyond the vehicle parked in the background of the picture. To the left, in the forefront of the driveway is a cluster of evergreen trees. This was a cluster of about four or five trees. The cluster was right at the base of the embankment that lead to the parkway ramp to the overpass across route 110. I would dart and play in the cluster of trees while my mother collected the mail from the mailbox. By the way, I did grow up to be a devout tree hugger. So my guess (childhood recall) would be about fifteen or twenty feet to the embankment. However, as the property deepened from the road, it did become wider. I mentioned in earlier emails, there were several out buildings in and around the end of the driveway to the left. There was a garage, and a small chicken house. Additional buildings were also in and around the back of the house. Oh boy, this is such a trip down memory lane. I now live in Michigan and am in my early seventies. Maureen Standish: Wow! Did not realize my story would make the newsletter. Nice layout. 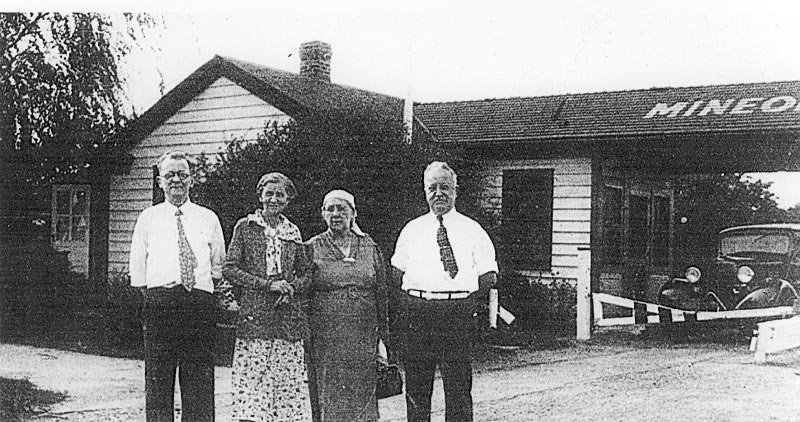 So pleased you were able to share the story of the Huntington Toll house. A little strange the story of the pre-fab material for the lodge coming from Michigan and now I live in Michigan to bring her story forward. The old saying, what goes around comes around. Also, nice eye work of the man regarding the Farmal Cub Cadet tractor. When we left Melville, we moved to upstate NY near Cooperstown. The tractor remained in my life until 1966. 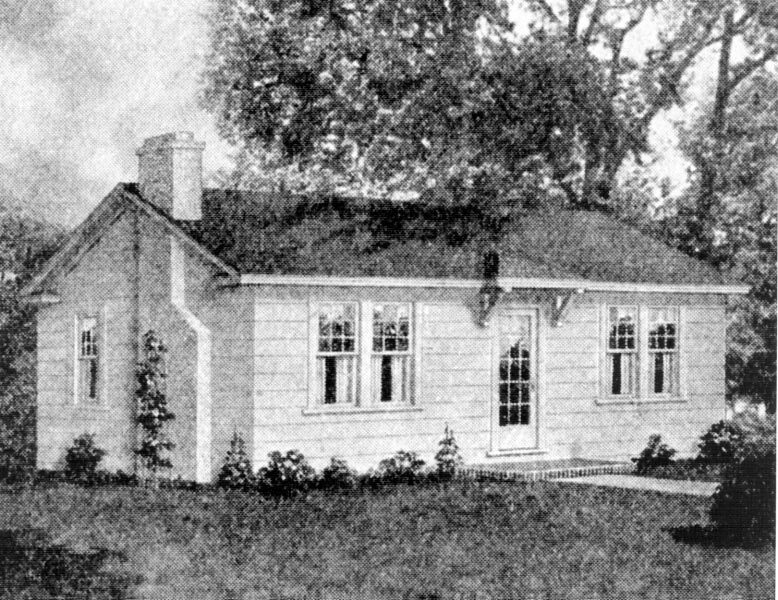 Howard Kroplick Note: Rather than build a lodge from scratch with a design from the now famous John Russell Pope, the Motor Parkway chose to purchase a pre-cut four room bungalow. 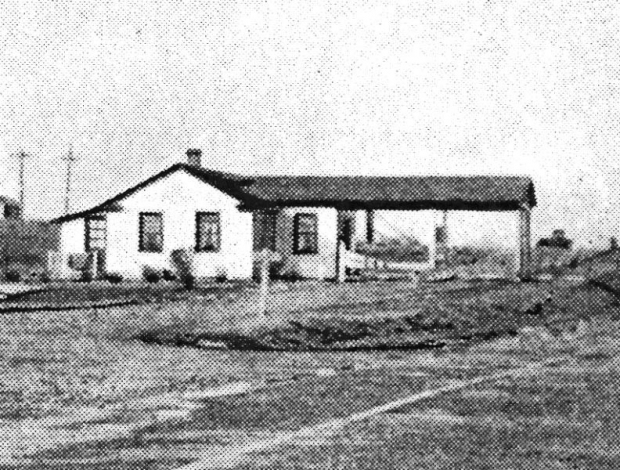 According to Al Velocci in his book "The Toll Lodges of the Motor Parkway, and Their Gatekeepers' Lives", the bungalow was ordered from Aladdin Redi-Cut Houses of Bay City, Michigan. Unlike the Russell lodges, the bungalow offered a single floor with a kitchen, dining alcove, living room, two bedrooms and space for a bathroom. This model was used for the Ronkonkoma Lodge, Mineola Lodge and the Huntington Lodge. Frank: Fantastic find of the Huntington Lodge! While I'm continuing to search for a 1938 aerial of the lodge, I came across two of your pics, 1930 and 1950 aerials of the Melville area. 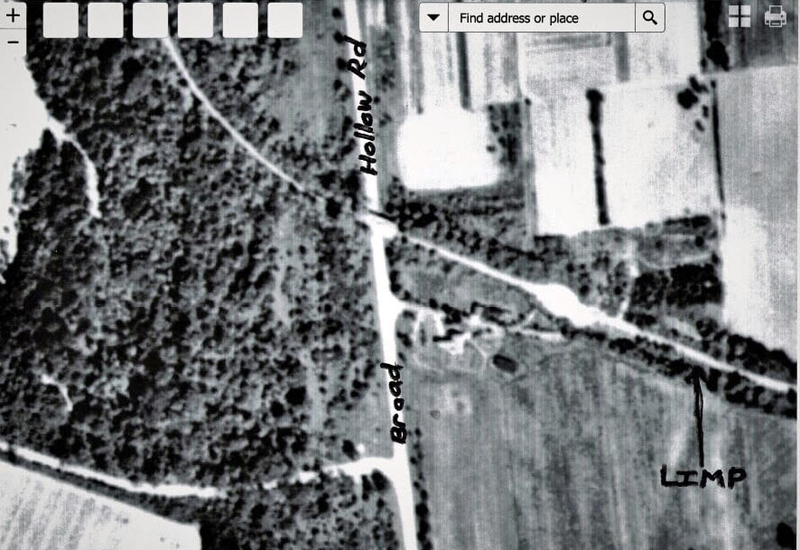 In the 1950, I circled just south of the LIMP what appears to be Maureen's home (lodge), driveway, and evergreen brush that she mentioned along the north side of the driveway (photo with the large truck and driveway). Could this be lodge? 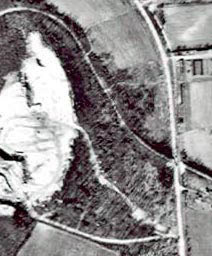 In the 1930, this area was clear. 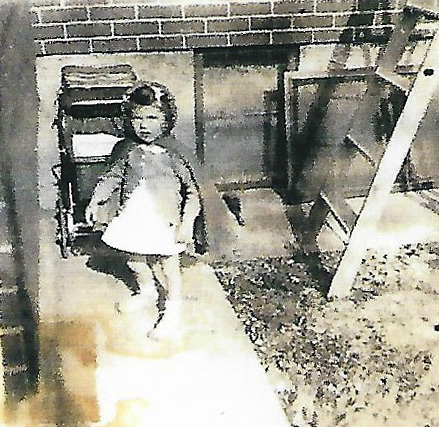 Maureen Standish….So wonderful of you to provide Howard with an amazing amount of info about your childhood home/life and your memories of the LIMP. VERY RARE that such detailed account of the Huntington Lodge has become available. Thank you on top of Thank you! 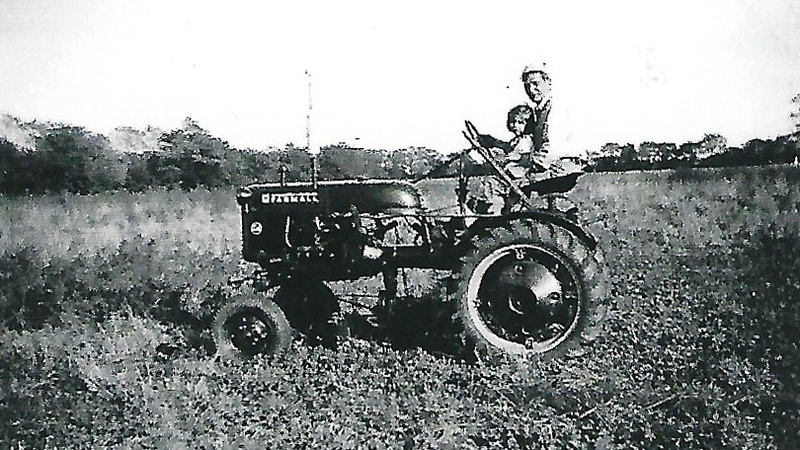 The photo with the International Cub tractor has to be early post war. The Cubs came out in 1947 and were unchanged through 1953. Yikes!!! The Huntington Lodge has finally been revealed! Very much thanks to Maureen for submitting her early photographs and of the lodge in Melville. This has been an impossible search up to now. The basement/foundation is very similar to that of the Lake Ronkonkoma Lodge. What incredible news that rarely comes around. I truly thought I would never see what this lodge actually looked like. Things were looking pretty dim for a while. Great stuff!! Thank you again Maureen. Hi Howard: S E N S A T I O N A L !!!! My hats off to you, Al and Ms. Standish !!! 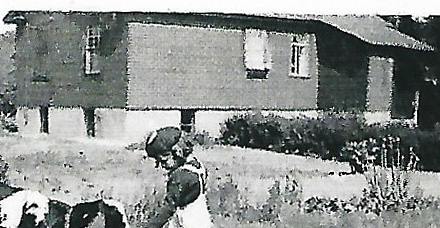 Very nice rare picture of the back of the Huntington Lodge.You don’t see many picture of the back of Lodges. Heard from people, They moved the Lodge, its nice to see from the picture,they moved it off the Motorpky R.O.W and saved it for a while.So They were right. Keep up the great work. 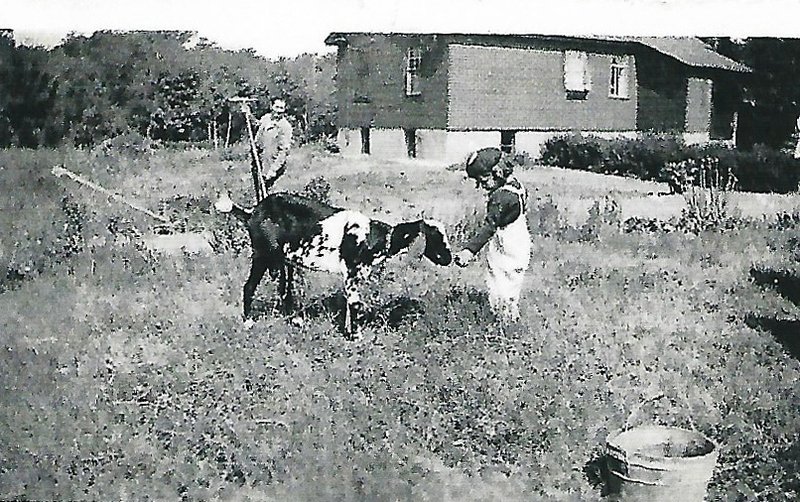 The old photos showing Melville lodge is a reminder of our family farm off Vanderbilt Pkwy in Hauppauge post WWll. 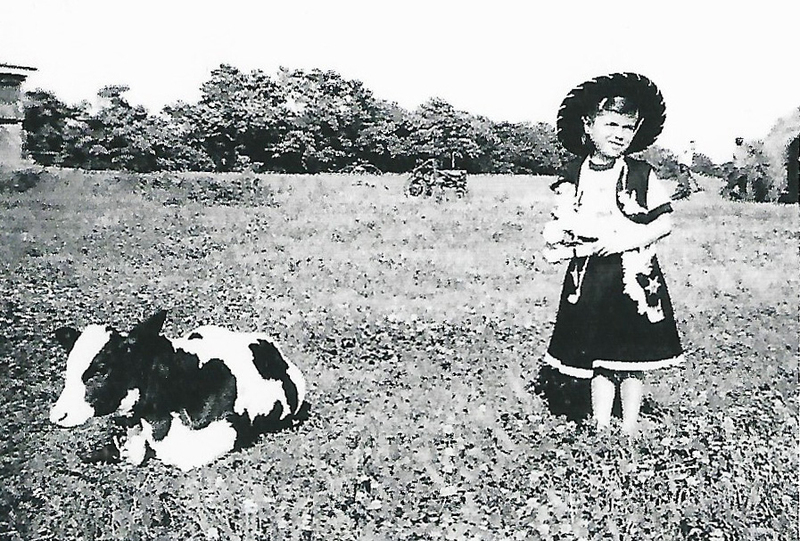 Growing up on a farm ,close to the land is an experience that sets values that lasts a lifetime. I also trailed the old Motor Pkwy routes and the remains ot a much older road paralleling and somtitime crossing over Motor Pkwy. Some of old Bridge Rd. Still exists in Hauppauge. Bridge Rd was once a stage coach and wagon trail and at that time was.still visible in the woods alongside.the pkwy. My brother Joe and I would follow the old road ,sometimes just two parallel depressions in the leaves with trees growing between. Occasionally on the sides of the path you would find large stones tossed aside by passing travelers. “The good old days”, I can still smell the soil and fresh air. Thank you for the memories. Phil. 1) How did you get in touch with Maureen? 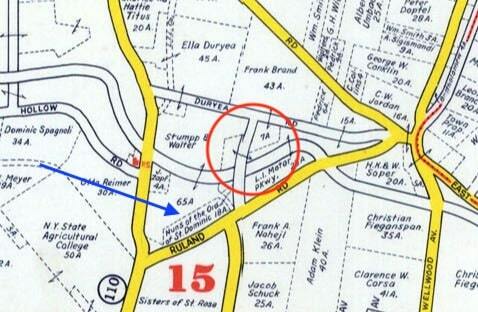 2) Where EXACTLY was the lodge moved to? There is a reason I’m asking but in this post it says it was moved south of the ROW. This might be a job for our cartographer extraordinaire Frank. A few years a ago I came across a large pile of debris that could be remains of a structure that is just south of the LIMP, east of RTE 110 so I’m wondering if this might be remnants of the lodge or an outbuilding perhaps? 1) Maureen contacted me after finding this website. 2). 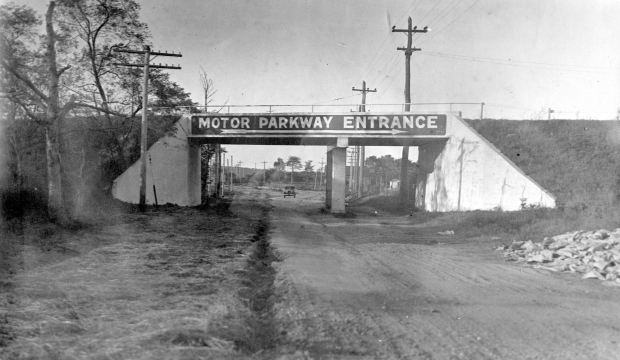 In 1938 this section of the Motor Parkway was given to Suffolk County. The building was moved south of Motor Parkway at least 50 feet from the middle of the road. Thank you Maureen for the wonderful story growing up in Melville. 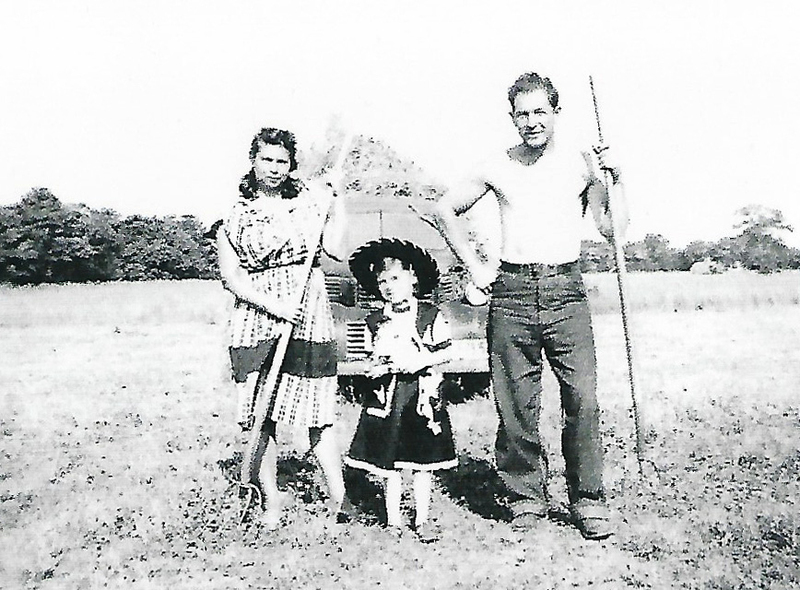 I believe you may have had a neighbor about your age (Edith Klarmann) who lived just to the south on a small farm off Ruland Road. Edith occasionally comments on this web site and I was curious if you two have ever met. Thank you Phil for pointing out Bridge Rd. 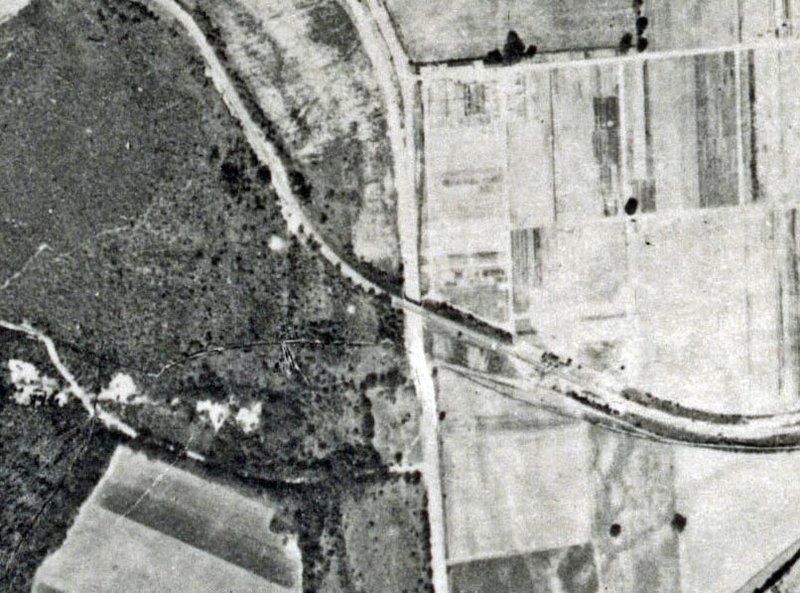 Today it is fragmented, paved, and lined with houses under a canopy of trees. I took a Google street-view stroll through it and found myself on a country road back in time. It still has its charm of yesterday but with a noisier Motor Pkwy nearby. I’ll be biking down this path when I’m in town! Thanks so much for the first hand account and photos, Maureen. Great that your memories of LI are still so vivid. Al - In your book, and as Howard mentions, I see the name of the future owner of the lodge property as Zaph. As Maureen remembers the owners were Zapf. A 1941 map of the area also shows the area owned by a J. Zapf and there’s a 1948 newspaper article in the Long-Islander of the $3,000 estate of a Jacob Zapf of Huntington going to his wife, Isaline. His death in ‘48 would tend to be in sync with the purchase of the property by Maureen’s parents around ‘49 or ‘50. If the true spelling is Zapf, interesting coincidence in that my friend whose house sits on the Mayan Ruins in Garden City which we visited last year is also named Zapf. While I don’t believe they are related (I’ll do some researching) that would be two different Zapfs living on the Motor Parkway (one in Garden City and one in Huntington). I’ll send the map and clipping if you would like. Frank- Your 1930 aerial displays the lodge structure extending across the parkway just like in Lake Ronkonkoma, excellent. 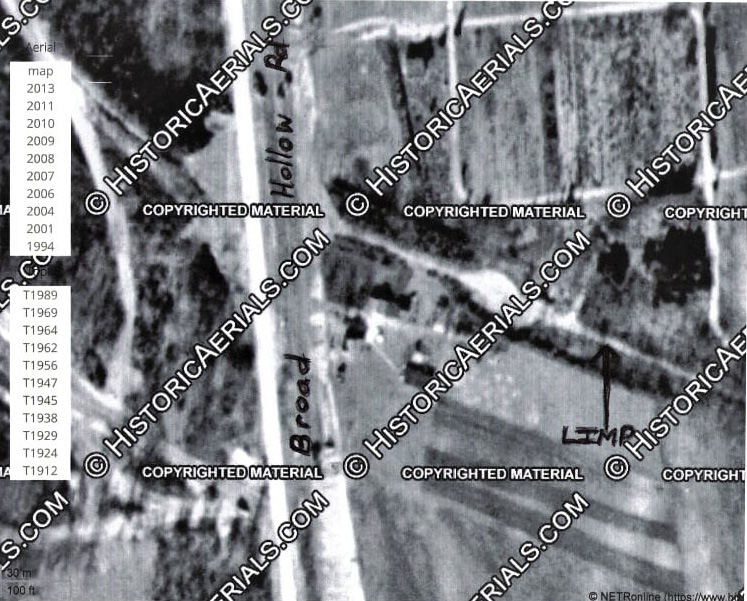 Then with the aerials from the late 40’s thru the early 50’s, the Schimkat’s property, etc; is clearly seen. Think we can even see the path that Maureen trekked on to go to school. Maureen and Edith knowing of each other would be the icing on the cake. This is just a wonderful story to read about life in LI at that time and the connection to the Motor Parkway. I thoroughly enjoyed this post. Thanks to Howard, Al and Maureen. I am so pleased to see all the comments regarding the find of the Huntington Lodge. Much appreciation that so many of you enjoyed the pictures. 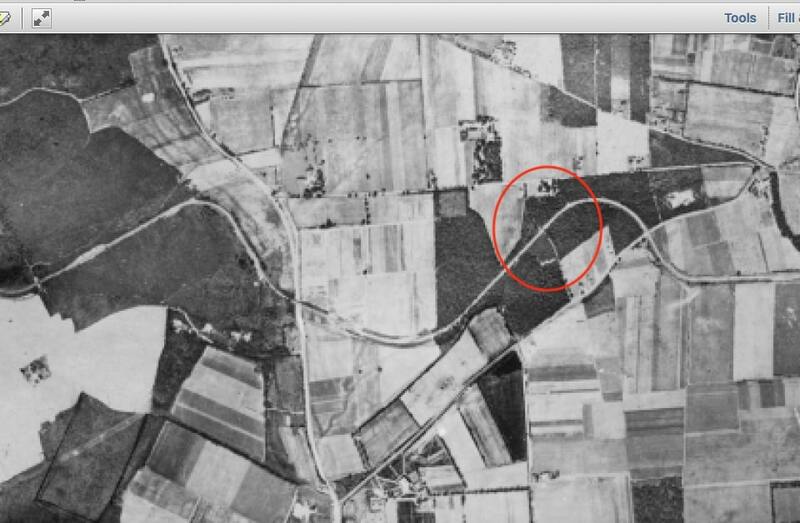 I especially enjoyed seeing the aerial maps and the confirmation of the location of the lodge. Since my trip down memory lane and the motor parkway, I have begun to work on more of my Long Island family being early settlers to New Amsterdam by the name of Boerum. I remember family stories about the Duryea car people and upon my recent hunt Boerums did marry into the Duryea families. This circle is growing tighter and tighter. Today I received a nice letter on old LLMP paper from a Ronald Ridolph expressing his delight about the Huntington Lodge. Called him tonight. Someone in the comments mentioned if I knew anyone living near the Huntington Lodge and the only two kids I played with were a Teddy Barley and a Patty Krewatt. Both lived in the five or 6 small houses on 110 south of my location nearer to a road to the left off 110 to Pinelawn Cemetery. Well, I have to rest. All this excitement! !